How to find a sword you want? 2. What are you going to use it for? Iaito practice? Hunting? Decoration? Backyard cutting fun? Collection? 3. What kind of target will you use you sword on? Tatami mat? Bamboos or wood? Water bottles? Bones or even metal cans? When you get the questions clear, you have done half to make a choice. You can find the catalogs on the left side of our webpage for the different style swords such as Japanese, China, Europe and swords in movie, then go to the sub catalog directly for the sword you want. A: Name of the sword: for example “walking dead”, “conan” and “Wallace sword” and so on. B: Color of the blade: Red, Black, Reddish black; Blue. C: Target of the sword: for example ”heavy cutting” “light cutting” “medium cutting”. D: Number of the Ryansword if you know: for example Ryan307, Ryan1124. E: Geometry of the blade: For example Sanmai,shihozumi,Maru and son on. F: You can try more. How to customize a sword? The first way is by click “DIY” and then follow the instruction there. When you submit the request, we will get an email about your customize information and we will get back to you very soon with the quotation and making time. The second way is you can order a sword on our website which is close to your request, then you can go to the webpage of “fittings available” ,you can find the different number for the blade type, the Bo-Hi and the different fittings and so on. Email us the number you choose then we will help you to complete the customization. If you are not sure how to determine the spec of the sword to match your size, please email us. Why can't I place my order? Swords are special goods, they are forbidden to have in some countries. So our productions can't be sent to all over the world. We only offer the service to the counties where we can ship. So if you can't place your order after you register with real necessary information that means we can't ship the sword to your country. If you can place your order, but you can't pay it, that means your country Customs will not complete accept the sword, there exist the risk of sending back to us. So please contact us for more information when you meet this during your purchasing. Is it necessary to do maintenance? How? The materials of handmade swords are carbon steel, it will get rust during storage, so oil the blade is a must. If you are not planning to disassemble the sword, you can only oil the blade with the Choji oil(special for sword).Motor oil will be ok if you have no Choji oil. Please oil the blade once a month or every time you use it. You can also clean and oil the whole blade with the tang together after you disassemble it if you are familiar with sword. A maintenance kit is helpful if you want to do this. Whatever, please be careful when you do maintenance. Is the customization free? What is the approximate time? Most of our productions can be customized but not free for all. Some of them are free, such as name engrave, sageo/ito changing, rayskin color changing and so on. Fitting changing is not free for all, if the fittings you changed are higher quality than the one on the sword you ordered, extra money will be charged. Other customize such as blade length, geometry, point of balance and so on, we usually charge extra 15% of the original price of the sword. Fitting changing does not cost extra time, but if you customize the blade size, then it needs about 20-25 days to get the sword ready. What is the delivery time? How if the sword is damaged during the shipping? The sword will be sent out in 3-5 days after you pay it if you didn't ask special customization. The deliver time is about 7-12 days,the carrier we used is China Post EMS express, door to door. You will get your sword in about 15-20 days after you pay it depends on the different area. Shipping time will be affected by multiple factors, such as weather, vacation and so on. We will take the responsibility for any of the damage during shipping, if your sword is damaged unfortunately, please send us the high quality pictures by email and we will help you asap. How should I custom my Iaito sword? Here is a reference table for the Iaito practicer. 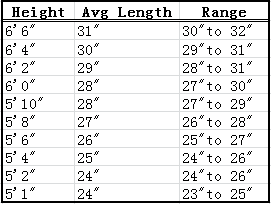 The length in the table is the blade length (nagasa). For the length of the tsuka (handle), you should ask your sansei for more spec information. What is the difference between a Iaito sword and a shinken(live blade)? Iaito is blunt for practice while Shinken is sharpened for cutting. Iaito is light and very well balanced. They are not used to cut but need to be continued drawing from the saya during the practice. Most of the Iaito have no Bo-Hi, less decorated, cotton wrapping is usually used. Shinken is made for cutting, so the shinken blades are different in weight and geometry. The point of balance is also a bit bigger than Iaito according to the different target. Based on the personal taste, a bit more fancy fittings are often used. What is the difference among the swords of heavy cutting, medium cutting and light cutting? A: Geometry. Just like the pic shows. The light cutting blades are made without niku, razor sharp blades have no niku at all. So do not use this kind of blade on hard targets in case the edge chipping during cutting. 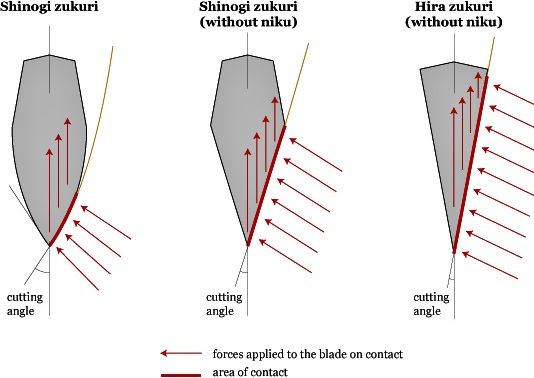 Most of the medium cutting blades we made have the second geometry in the pic, Shinogi zukuri (without niku). This kind of blades is well balanced for both soft and hard targets. The blades of this kind of swords are also very sharp. Heavy cutting blades we made have niku, they can be used on heavy cutting (for thicker soaked tatami rolls, bamboos, bones and so on) without chipping or bend. B：Material of the blade. Most of our light cutting blades are made of 1060, folded steel and 1095 steel, maru structure. Middum cutting blades are made of 1095,T10, folded steel, mono or sanmai(1095 combined with folded steel or iron).Heavy cutting blade are also made of 1095,T10, folded steel, Sanmai.